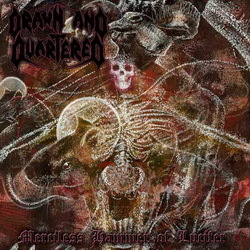 The sonic embodiment of its title, Merciless Hammer of Lucifer is DRAWN AND QUARTERED’s darkest, most definitive statement. Moodier and more malevolent, these Satanic death metal gods harness eldritch energies for their most blackened attack yet! Enhanced CD with 3 videos plus first 3,000 units released as Limited Edition including a bonus disc comprising the ultra-rare Crusaders of Blasphemy MCD and other unreleased rarities.